This page is used for examining whether findings from different laboratories can be explained in terms of IPL mechanism. In a recent work by Chettih and Harvey (2019), authors artificially triggered several spikes (action potentials) in single neurons in layer 2/3 of mouse visual cortex V1area. This resulted in spiking activity in a group of sparsely distributed neighbouring neurons in the same neuronal order and were correlated in time. The small population of neurons that were excited were located at short distance (25–70µm) from the stimulated neuron. The stimulation had no influence beyond 300µm (for summary, see News and Views article by Ikuko Smith (Smith, 2019). Authors called this lateral spread of activity between neurons "influence-mapping." There is one important question. How does excitation reach at the laterally located neurons in a time-correlated manner, which is responsible for influence-mapping? This can be explained by the testable mechanism derived by semblance hypothesis (Fig.1). It is related to the previous explanation of visual perception as a first-person property using the derived mechanism of generation of internal sensation at physiological time-scales (Vadakkan, 2016). The units of internal sensation of perception are induced at the inter-LINKed spines that belong to different neurons. When a single neuron is artificially fired, the back propagating action potentials will reach the dendritic spines. It will then continue to propagate through the inter-LINKed spines to the neuronal soma of the inter-LINKed spine’s neuron (Fig. 2). The spines that inter-LINK can belong to neurons that are separated by up to 300µm, a distance beyond which the probability of overlapping of dendritic arbor between neurons diminishes substantially. Figure 1. 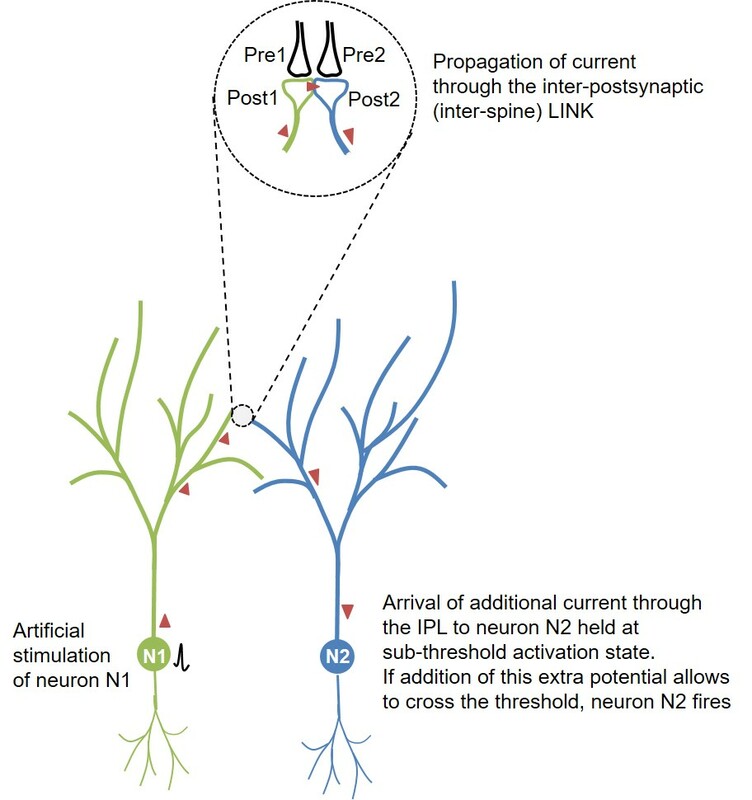 Schematic diagram showing the route of propagation of action potential from the artificially fired neuron N1 towards the sparsely located neuron N2 within the layer2/3 in visual cortex. This spread taking place through the inter-LINKed spines Post1 and Post2 can explain what the authors describe as “influence-mapping.” Note that the inter-postsynaptic functional LINK (IPL) between Post1 and Post2 was explained as responsible of induction of internal sensation for perception (Vadakkan, 2015). Overlapping of the dendritic arbors between the neurons N1 and N2 increases the probability of IPL formation when neurons N1 and N2 are separated only by a short distance (25–70µm). b) When a neuron was fired, majority of neurons that were tuned to respond to similar features to that neuron were strongly suppressed than the neurons with a different tuning regardless of the distance from the stimulated neuron. Inhibition of the spikes in the neighbouring neurons can be explained by activation of surrounding inhibitory interneurons. Burst of action potentials in excitatory neurons can activate somatostatin expressing inhibitory interneurons (Kwan and Dan 2012). Similar type of inhibition of surrounding areas are seen in locations where internal sensation of perception is expected to occur in the olfactory glomeruli in Drosophila. When one glomerulus is activated, inhibitory local interneurons (ILN) inhibit all the remaining glomeruli (Hong and Wilson 2015) enabling the specificity of the percept for that particular smell (Vadakkan, 2015). Orientation tuning is tested by a source of light. This will cause activation of large number of islets of inter-LINKed spines within one cortical column. But when single neurons are artificially fired the backpropagation of potentials will reach only specific sets of inter-LINKed spines. This explains why only neurons that are located sparsely are fired, correlated in time. Verification: Based on semblance hypothesis, the prediction that can be made is the presence of inter-postsynaptic functional LINKs (IPLs) between spines that belong to the artificially fired neuron and the sparsely located neurons that were fired in a time-correlated manner. A recent study examined the nature of oscillating extracellular potential both during learning and memory retrieval (Vaz et al.. 2019). In order to reactivate the same set of IPLs that formed during learning at the time of memory retrieval, it is necessary to have almost similar conditions that were present at the time of learning. Maintaining the same frequency of oscillating extracellular potentials is a major factor in achieving this. Based on the semblance hypothesis, the synaptic transmission in one direction and propagation of potentials in a near-perpendicular direction through the inter-postsynaptic functional LINK (IPL) contribute vector components to the oscillating extracellular potentials, which is essential for binding and integration of units of internal sensations for providing the sensory qualia of memory. The findings of this study that show that similar frequency of oscillating extracellular potentials are present both during learning and memory retrieval support the expectations of semblance hypothesis. Similar to the action potentials (axonal spikes or neuronal firing) occurring at the axonal hillock, there are spikes occurring at the dendrites. These are called dendritic spikes. Based on the strength of summated potentials, a rough estimate shows that they constitute synchronous activation of nearly 10 to 50 neighboring glutamatergic synapses triggering a local regenerative potential (Antic et al., 2010). Depending on the channels involved, there are different types of dendritic spikes. Recently, it was found that distal dendrites generate dendritic spikes whose firing rate is nearly five times greater than at the cell body (Moore et al., 2017). Another group of investigators who have previously shown that dendritic spikes are related to behavior and cognitive function recently found that dendritic calcium spikes contribute to surface potentials that are recorded as electroencephalogram (EEG) (Suzuki et al., 2017). Surface EEG recording is generated by current sink that reflects the net potential changes within the extracellular matrix space. This is expected to be contributed by several factors. It is known that the surface positive potentials are generated mainly by synaptic inputs from other cortical and subcortical regions to the pyramidal neurons located between L2/3 to L4 regions (Douglas and Martin, 2004). Recent studies by Suzuki et al., has found that dendritic calcium spikes at the main bifurcation points of the apical dendrites of L5 pyramidal neurons (note that L5 pyramidal neurons are upper motor neurons that direct motor movements of the body) also generate the surface positive potentials (Suzuki et al., 2017). The last two findings lead to the questions, “How can two different sources of potentials provide similar surface positive potentials?" "Can we provide an interconnected explanation?" Since dendritic spikes are related to both behavior and cognitive functions and since IPL mechanism can explain generation of concurrent internal sensation of memory and behavioral motor action, can IPL mechanism explain the above findings? Since the apical tuft regions of all the pyramidal neurons are anchored to the pial surface, the dendritic arbor of all the pyramidal neurons is overlapped at the recording location of Suzuki et al., (2017). In this context, it is necessary to examine the potential changes occurring at the neuronal processes around the recording electrode. In the context of the IPL mechanism, it is anticipated that the dendritic spines of different neurons have formed large number of islets of IPLs between them at these locations. By examining the zone from where low-threshold calcium spikes were recorded (Suzuki et al., 2017; Larkum and Zhu, 2002), the following is possible. Spatially, main bifurcation points of the apical dendrites of L5 pyramidal neurons are also locations where spines of the L2/3 pyramidal neurons receive their inputs. Based on the IPL mechanism, several of these spines are expected to be inter-LINKed to form large islets. These islets are also expected to be inter-LINKed with spines of L5 pyramidal neurons for initiating or controlling motor actions. The potentials through the IPLs are expected to arrive at the axon hillock of the L5 motor neurons that are kept at a sub-threshold state (see figure 5 in FAQ section of this website) for motor action (Fig.2). For a system that operates to generate internal sensations and initiates or controls concurrent motor actions, the islets at appropriate locations are expected to transmit potentials to the axon hillock of the L5 pyramidal neurons that are upper motor neurons. Calcium spikes are generated at the postsynaptic locations within the islet of inter-LINKed spines possibly due to an increased density of these channels at these locations. Since the pyramidal neurons are found to be under the influence of an inhibitory blanket (Karnani et al., 2014), a function of dendritic spikes is to generate sufficient potentials to overcome this inhibition. In other words, there is a provision for increasing the inhibitory blanket around an L5 pyramidal neuron axon hillock as the size of the islets of inter-LINKed spines that are connected to these neurons increase. This will make sure that the L5 neuron fires only at the activation of specific sets of IPLs that generates a specific conformation of semblance for both the internal sensation and concurrent behavioral motor action. Figure 2. Figure explaining a potential mechanism occurring at the level of the main bifurcation point of an apical dendrite of a L5 pyramidal neuron (based on semblance hypothesis). The circles with different colors represent an islet of inter-LINKed spines (dendritic spines or postsynaptic terminals) that belong to different pyramidal neurons at the level of the main bifurcation point of the apical dendrite of L5 neuron. Note that one of the spines (in violet) belongs to one of the L2/3 pyramidal neurons. Also note that the inter-LINKed spine of the far right end of the islet (in green) belongs to L5 pyramidal neuron. During development, neurons of different cortical neuronal orders descend from the inner pial surface area by anchoring the apical dendritic terminals to the inner pial region. This allows overlapping of the dendritic arbors of neurons from different orders, which leads to abutting of their spines that eventually leads to formation of inter-LINKs between these spines during learning. The waveform shown at the level of the inter-LINKed spines indicates that the oscillating extracellular potentials recorded have a major contribution from the propagation of potentials through the islets of inter-LINKed spines. Secondary factors can determine different wave forms depending on the locations from where recording is carried out. They include number of neuronal layers, recurrent collaterals, connections with the projection neurons from other ares of the brain etc. Figure not to scale (spines in the islet are drawn disproportionately large compared to the size of neurons). The explanation that synaptic transmission and propagation of potentials through the IPLs provide vector components of oscillating extracellular potentials also becomes suitable. If the arrival of potentials from sensory stimuli evokes dendritic calcium spikes along with the reactivation of specific inter-LINKed spines (and their islets) inducing units of specific internal sensations concurrent with activation of specific sets of motor neurons, it can provide an explanation how dendritic calcium spikes are related to behavior and cognitive function. The findings of Suzuki et al., necessitate examining the role of background EEG wave forms, frequency of which is correlated with normal level of consciousness. In this regard, the explanation by the IPL mechanism that the net background semblance induced by reactivation of inter-LINKed spines contributes to the internal sensation of consciousness (Vadakkan, 2010) becomes a suitable mechanism that can be subjected to further studies. Each place field consists of a unique set of CA1 neurons that fire action potential. At the dendritic regions, calcium transients informs about a change in potentials occurring regeneratively either due to back propagating action potentials (bAP) or by dendritic spikes. Recent studies observed calcium transients secondary to regenerative dendritic events in place cells that can predict place field properties (Sheffield and Dombeck, 2015a; Sheffield et al., 2017). These calcium transients have a highly spatiotemporally variable prevalence throughout the dendritic arbor. In some cases only a subset of the observed branches displayed detectable spikes, which indicates that spikes originated at these dendritic branches. None of the observed branches in many cases displayed detectable spikes during place field traversals while the soma (and axon) fired. This means that the bAP did not reach these locations. From the findings of Sheffield and Dombeck, it is clear that dendritic spikes are related to spatial precision. However, this finding needs a mechanistic explanation. The above finding can be explained by the occurrence of dendritic spike occurs at an islet of inter-LINKed spines that belong to different CA1 neurons (Vadakkan, 2013). This has the following advantages. a) Activation of inter-LINKed spines within an islet of inter-LINKed spines induces units of internal sensations for a specific place. b) One dendritic spike at an islet of inter-LINKed spines that belong to different neurons can explain firing of different CA1 neurons that are being maintained at a sub-threshold state at the time of the dendritic spike. It also supports why a high percentage of place cells are shared between different places. c) Since potentials degrade as they reach the axonal hillock, it may require potentials arriving from more than one spike to contribute to the firing of a CA1 neuron depending on latter’s sub-threshold level. d) Highly spatiotemporally variable nature of spike depends on the qualia of internal sensations that they induce in response to and matching with the place (which depends on previous associative learning events with different places). The latter property can explain the expected binding feature (Sheffield and Dombeck, 2015b). Epileptic activity in the hippocampus propagates with or without synaptic transmission at a speed of nearly 0.1m/s (Jefferys, 2014). Experiments showed that longitudinal propagation of epileptic activity from one end of a neuronal order to its other end in the hippocampus takes place independent of chemical or electrical synaptic transmission (Zhang et al., 2014). Since this spread of epileptic activity occurs at a speed of 0.1 m/s and is not compatible with ionic diffusion or pure axonal conduction (Jefferys 2014; Zhang et al., 2014), it requires an explanation at the cellular and electrophysiological levels. In this regard, rapid chain propagation through the inter-postsynaptic functional LINKs (IPLs) explained by the semblance hypothesis (Vadakkan, 2015) offers a suitable explanation for a mechanism.